"My Cousin Izzy" & "It's All in the Executions"
Everyone wants to have a moment of great triumph and strength in their lives. If we're all being honest with ourselves, we'd like to have one of those majestic movie moments, right? You know the ones I'm talking about: where the music swells and you're running down the street and everything just feels epic. We all want to be the heroes of our own story and that's what Galavant's finale really focuses on. It centers around two characters, primarily -- Galavant and King Richard -- who both really just want to have epic, heroic moments. They want to save themselves and the people they care about. They want to prove their worth. But there are always obstacles for heroes or for those who are attempting to become heroes. And, ironically enough, Galavant and King Richard have always been their own obstacles. Galavant has always believed that life has to be epic and that his heroic moment would be the same. What he realizes, I think, is that heroism is simply doing the right thing no matter what. It's being brave even when there isn't an epic score. And King Richard has always been his own stumbling block, but we'll talk about that momentarily. For now, let's review how Galavant's final chapters unfolded, shall we? Quick summary: Kingsley and Madalena are preparing to take over the kingdom and overthrow Richard, while Galavant, Isabella, Sid, and the King and Queen remain locked in the dungeon. In an actual act of bravery, King Richard decides to stand up for himself and fight for his kingdom by challenging Kingsley to a duel. Unfortunately for Richard, Kingsley chooses Gareth as the champion to fight for him and -- after being brought up to the throne room -- Galavant decides to be heroic and volunteers as Richard's champion. The two never get to duel because Isabella's young cousin (and also her betrothed) comes in town, also throwing off the Galavant/Isabella progression that happened before his arrival. My thoughts: I only have one qualm with Galavant and it's that since episodes air back-to-back, they often seem to blend together into one episode. As I was reviewing my notes, I was trying to recall exactly what happened in this episode and remembered that it spent a great deal of time focused on Galavant waiting for his moment to arise. I loved that "My Cousin Izzy" set up this idea that is so common throughout musicals and fairytales: the idea that you only get one great moment in order to become a hero. What Galavant reminded us of, however, is that being a hero isn't made up of one giant moment. It's comprised of all of the little ones -- all of the seemingly insignificant choices you make throughout your journey. THAT is what becoming a hero means. It means seizing opportunities and being brave in every area of life. Galavant is so consumed with this idea that his father instilled in him of having one great moment that he emotionally distances himself from others (especially Isabella) throughout the episode in order to focus on himself. Galavant isn't the only one acting heroic this episode. Finally -- after spending nearly his entire life afraid of himself and others -- King Richard acts brave and challenges his brother to a duel, mistakenly assuming that Kingsley would fight for himself. Of course, Kingsley does not and enlists Gareth as his champion of sorts to battle King Richard (actually, Galavant volunteers to be the one to fight Gareth FOR Richard, which is a nice bit of character development right there). I love this moment because Richard has been building toward some development since last week's installment of episodes. He's realized the reason why he's always been so timid and so desperate for attention and now? Now he realizes how to remedy it. He makes the decision to stand up to a brother who taunted and tormented him, a wife who dismissed him, and a kingdom who loathed him. He decides to be a HERO. Unfortunately for Richard, he doesn't realize (hey, much like Galavant! Lovely parallelism right there) that being a hero is more than just having one moment of bravery: it's having a lot of moments of bravery spanning a lifetime. THAT is what makes someone heroic. We'll talk more about Gareth and Richard's relationship in a moment when I discuss the finale, but it really was wonderful to finally see Richard become a man with a backbone. All of our heroism leads us into "It's All in the Executions," though, where our favorite characters are scattered throughout the land and sea because of their heroism or villainy. "It's All in the Executions"
Quick summary: Galavant strategizes in order to figure out a way to save everyone. His plan? To have Richard kill Kingsley in order to ensure that he doesn't have to fight Gareth and they can all escape. Unfortunately, Kingsley figures out the plan and throws them in the dungeon, prepared to execute them. Gareth rescues Galavant and Richard and sends them away on a ship so they will not be killed. Galavant makes Gareth promise to take care of Isabella and Sid and ensure their safety, which he does. Again, unfortunately, Isabella's young cousin locks her in a dollhouse-like room within his castle because why not, right? Oh and Madalena kills Kingsley because she's bored with him and invites Gareth to take the throne with her, which he does. And that's how we end the season! My thoughts: Everyone is scattered in the season (or series) finale of Galavant. Our title knight and the cowardly king are teaming up in order to take down Kingsley. That plan goes horribly awry, however, but I absolutely loved the bonding that occurred between them. The important theme in "It's All in the Executions" was the theme of protection. How far would you go in order to protect the thing that is most important to you? For Gareth, he sends King Richard and Galavant away in order to protect them from himself and from Kingsley. If Richard and Gareth had been forced to duel, there's no doubt in anyone's mind that Gareth would have killed Richard -- he would have HAD to. And there's this intense moment where Richard is imprisoned and making light of the situation when Gareth actually expresses a lot of anger at his best friend for waiting his entire life to stand up for himself until that moment. Essentially, Gareth asks why it had to be then -- why couldn't he have taken his advice years ago and started standing up for himself? Gareth's question places blame on Richard for the complexities and events that are unfolding and it's actually a really painful moment to watch Gareth push his best friend away in anger. Galavant desires to protect the ones he loves too, by making Gareth promise that he will keep Isabella, Sid, and the others imprisoned safe. (Also, I don't know if I'll get the chance to talk about this later on but Galavant and Isabella finally kissed before he was dragged away and I am so glad that they did, but also so mad that he was about to tell her that he loved her. Ugh.) Gareth keeps his promise and rescues everyone but Sid from the dungeon and sends them off to safety. Sid, of course, is essentially insurance and collateral damage in case Galavant doesn't keep his promise. There's a tiny moment in this episode in which you also see how Madalena protects herself -- she kills Kingsley. It's a little "wtf" moment for those of us watching but when you really think about it, it makes sense. Madalena's main concern is protecting her own interests. She wants to rule the kingdom and she wants to do it without people standing in her way. Kingsley, initially part of her plan, became a hindrance and an obstacle to her happiness. So she eliminated him. Just like she eliminated Galavant and Richard, too. Madalena's such a fantastic character because she's so heartless and conniving and really, really smart. She knows what she wants in life and I think that when she was a maiden, she didn't. I think she got a little taste of power in the kingdom and realized that it wasn't enough for her. Bitterness and boredom turned into scheming and plotting and our once fair maiden became a cold killer because she took what she wanted by force. Gareth respects that, as we already heard him say last week, because he respects and has a healthy fear of strong women. And that's why Madalena invites Gareth to sit on the king's throne beside her. As Galavant ends, we see the beginning of a hero's journey (Richard) and the seemingly grim fates of others (Sid, the kingdom under Madalena, Isabella, and Galavant). If the series was meant to teach us anything, what I think it did teach us was that becoming a hero isn't an easy journey. It isn't one moment -- one moment, however great, doesn't define your entire life. It's the idea that you take one moment of bravery and you continue to use it to propel you toward more and more moments of bravery. That's the real hero's journey. The first episode ("My Cousin Izzy") was the first episode of the show that was written by Scott Weinger and I thought he did a fabulous job. The whole running gag of "This Is My Moment" was fantastic, as were all of the snark and quips throughout the episode. I always am a fan of that type of humor and it did not disappoint. Additionally, thank you Kristin Newman for writing "It's All in the Executions" because it contained one of the funniest scenes in the entire series (the song pausing and Galavant/Richard sneaking silently past guards) during one of the funniest songs in the entire series. So thank you for that! "Our faces got unusually close..."
"And... not sure who the black kid is." "Wow." Galavant continually getting interrupted during "This Is My Moment" was my favorite thing ever. "And Galavant doesn't lose a duel." "Ooh, third person alert." "But trust me, princess, my mind and heart would be clouded." AWWWWWWW. Shipping it. y'all. "If you eat that last danish, I will reach down your throat, yank it out, and beat you with it." Like, I feel as if it cannot be overstated how much I love Madalena. "Speaking to you is one of my favorite things to do. In fact, my favorite conversation ever was our four hour analysis of what Sid's 'thank you' meant." When Galavant finally finished his song: "... That's it?" "That's all I've got." THEY PLAYED "KISS THE GIRL" IN THE BACKGROUND OF THE SCENE WHERE SID CONFRONTS GALAVANT ABOUT AVOIDING ISABELLA. "I haven't laughed so hard in minutes!" Oh, Timothy Omundson. I will miss you most of all. "AWWWW, you worried about me Gare-bear?" The drunken song about their secret mission between King Richard and Galavant is my favorite thing this show has ever done, I kid you not. "It's like your beautiful brain exploded on your face." ISABELLA FINALLY KISSED GALAVANT YAYYYYY. "I'll come back for you!" "Please do! So scared!" "Will all this singing kill our Nielsen ratings?" I giggled for a full minute after that line was sung, not gonna lie. Well, folks, I wish I could say that I would see you next season but it appears unlikely that we will. 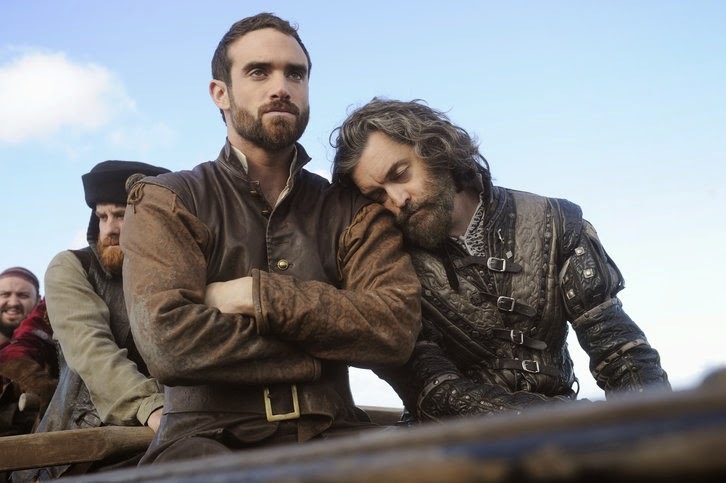 :( Galavant is such a gem (and managed to tell better and more cohesive stories in eight episodes than most shows do in twenty-two) and I would really like it to be renewed because they can't end it there, right? RIGHT? I really enjoyed the episodes this week. The show has consistently gotten stronger and stronger and I really hope to see more of it. It started out as a funny, wacky ride and went on to do a lot of development of its characters and comment on story tropes in a really smart way. The knight isn't the gallant hero to begin with, the damsels don't really need any rescuing, the servants are fairly unhappy with their lives and have lots of intelligent things to say, the older royal brother is horrible and bloodthirsty and the younger is immature, thoughtless and clingy. I was so thrilled to see Anthony Stewart Head in his short appearance as Galavant's father! I've loved him since Buffy and anytime I can see him be funny and sarcastic and singing is a win in my book. I imagine that if Madelena had not been kidnapped Galavant would have followed in his father's footsteps in many ways. He would have remained emotionally distant and full of himself(cause it's heroic and manly), married Madelena and they both would have ended up with very little respect for each other. Madelena would have harped on him no end and he would have avoided her more and she would have yelled louder and he would have believed that his father was right about not getting married too. I love that we saw Galavant be wrong about every aspect of his "destiny", from Madelena to King Richard to the very nature of heroism. I like that they really poked fun at the idea that heroes are stoic solitary types who repress their feelings (I'm looking at you Oliver Queen) and I loved when Sid tried to keep from crying over Galavant's supposed death "I'm repressing my feelings just like Galavant taught me to do." Thank you show runners for using progress made in previous weeks to continue propelling King Richard forward, growing up and taking responsibility for his life. He's still charmingly clueless but he's trying and I love that. Omundson was a total MVP in this series and boy does that man have amazing hair! His relationship with Gareth was my favourite thing and it progressed in a believable and moving way. The twist of Gareth ending up on the throne was fascinating. Of course, Madelena has no hang ups with status or rightful rulership; not being royal herself she goes for competence over birth and Gareth is competent. I would love to see how those two get along and clash etc. It was amazing that handmaiden Gwen's anger at her life led her to plot the murder of all the rich folk making things bleak and miserable for everyone like her. And I love that chef Vincenzo couldn't go through with it but made them all violently ill instead. Wonderful. When Isabella's little cousin locked her up in a dollhouse out of the blue my first reaction was "This has taken a really creepy turn." It felt abrupt and weird and yet as it sunk in I realized two things: it's another fairy tale trope with a twist and most importantly, Galavant is now in exactly the same situation he was in at the beginning of the series- his lady love is being held against her will in another land by an immature and slightly creepy ruler. Here we go again! And I wish we would go again on another season! - "It's too late now isn't it? It's out there. It's rattling around in my head taking up space where fight thoughts should be." hahahahah oh man, fight thoughts... This the all time best line from Galavant. - "It is I Prince Harry, ruler of Hortencia and my mummy's special big boy." "Oh, isn't he adorable." - *romantic kissing moment* "You have a family of spiders in your hair." Please renew! I love these characters. BECCA! Ugh, this show has gotten to be so delightful and hilarious and strong and I'm so bummed that a second season is uncertain because we NEED another year with these people after the finale. I loved how even though it was a seemingly silly series, it actually had a whole lot of depth to it (like you noted with Galavant and Richard). I would seriously also love to see another season of Gareth and Madalena because YES. How exciting would that be? GWEN WAS HILARIOUS. I didn't get to talk about the whole story with her and Vincenzo but I thought that was absolutely delightful and perfect. Someone astutely said that it's basically what Downton Abbey would be if it was a musical. C'mon, ABC. We need another season of this hilarious show. Please and thank you. Fantastic review. I love Gaaaaalaaaaavaaaant. "You're gonna have to either lose or gain a lot of weight." Thank you for your compliment! Man, I just love Gareth so much. I absolutely need to have a second season just so I can hear him sing some more and see his relationship with Madalena unfold.